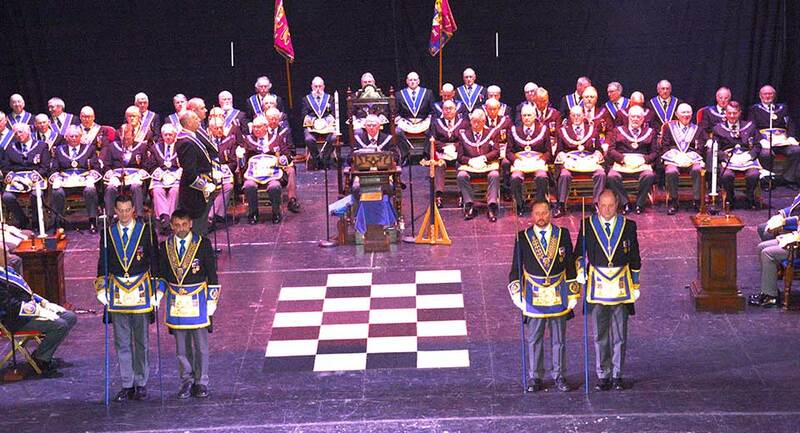 Once again, the Opera House Theatre at Blackpool hosted one of the highlights of the Masonic year as over 1,100 Freemasons attended the annual meeting of Provincial Grand Lodge. This year’s event was hosted by the South Fylde Group and was also very well supported by visitors from far and wide who joined their West Lancashire colleagues for this very colourful and impressive ‘day at the seaside’. Following the usual pageantry of the processional groups onto the stage at the start of the afternoon, Provincial Grand Master Tony Harrison opened the proceedings by warmly welcoming everyone. He then invited the assembly to observe the normal ‘token of respect for departed merit’ for those brethren who had been ‘called to higher service’ since the last meeting. The distinguished visitors from other Provinces were then introduced, as were the leaders of other Masonic Orders, before they were welcomed in the traditional and typical West Lancashire fashion. Tony then continued by re-appointing his Deputy and Assistant Provincial Grand Masters, with the single exception of David Grainger who was retiring after five years tireless service as the APrGM with responsibility for both the Lancaster and the Furness Groups. New Assistant Provincial Grand Master Keith Kemp. A little fleetness of foot was required for the next item of business, as the new APrGM to be appointed was at that moment, still occupying the office of Provincial Grand Director of Ceremonies. With commendable dexterity, Tony solved the apparent problem by promptly appointing and investing Malcolm Bell as the new PrGDC, thus making Keith Kemp available to be duly obligated and invested as an APrGM. Following the announcement of those who had been appointed to or promoted in grand rank, Tony detailed the changes in group chairmen and vice chairmen, resulting from a number of retirements. The annual treasurer’s report was well received and gained even more acclamation when Neil Latham revealed that he was not recommending any increase in the level of fees for the coming year. A presentation was then given by Paul Crockett, Fundraising Officer for the Masonic Charitable Foundation, in which he gave impressive detail of the work of the charity, especially focussing on the financial aid that has been given to both Freemasons and charities within West Lancashire during the past year. He further explained that ‘being in festival’ is not just about fundraising but also affords everyone an opportunity to not only participate in events and activities but also to lean more about the essential work of the MCF. Tony thanked him for both attending and imparting such useful and encouraging detail. He further commented, saying to the assembly: “Your support for the Festival so far has been incredibly generous and it’s vital that we maintain this momentum with only two years remaining, as it is the proceeds from these Festivals that supply the support of those brethren and their dependents who are in need.” Appropriately, at this point, a collection was made that was later revealed to have raised £4,667 towards the total for the MCF 2021 Festival. Following the collection, the appointment and investment of acting Provincial grand officers began with the first two new appointments being those of the Provincial Senior and Junior Grand Wardens. These offices were filled by David Edwards (Blackpool Group) and Paul Storrar (Gladstone Group) respectively. With the acting offices all completed, Tony then went on to appoint and invest all those who were receiving a first appointment to Provincial grand rank. Before continuing with appointment of those who were receiving a promotion in rank, he gave his annual address to the brethren. The full text of the address can be read / downloaded here. With all the major business of the meeting completed, one of the final enquiries by the Provincial Grand Master to his Provincial Grand Secretary brought forth both an amusing reply and a great deal of laughter from the audience. 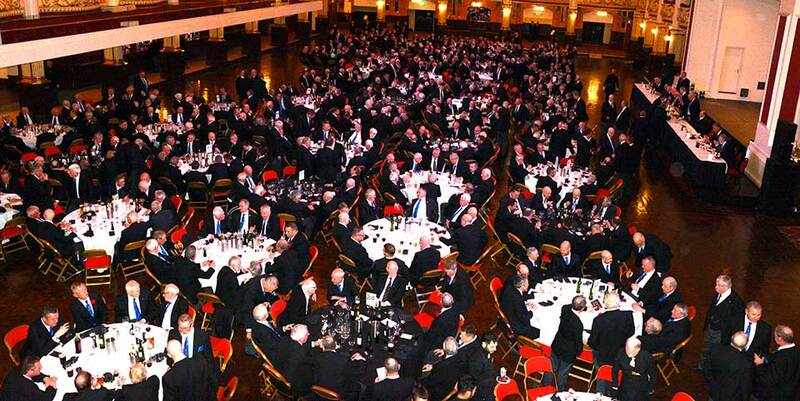 Tony asked: “Do we have an invitation to hold Provincial Grand Lodge at Blackpool next year? Following the closure of the meeting, the ‘Celebrant’s Banquet’ was held in its usual venue, the Empress Ballroom. Both the wine and accompanying toasts flowed effortlessly, concluded by the response to the toast to the newly appointed and promoted brethren being given by the new Provincial Senior Grand Warden, David Edwards. Celebrations in the Empress Ballroom.